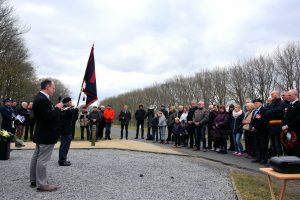 The 2 Lincolns Battlefield & Remembrance Tour took place between 18-24 March 2018. The tour group consisted of WWII 2 Lincolns veteran Mr John Blood and 20 others, all of whom had direct family connections to the Battalion. 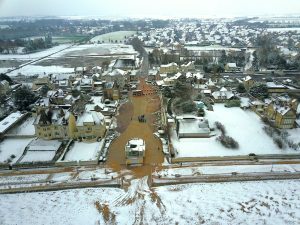 Day 1 – The 2 Lincolns tour coach departed from a snow covered Lincoln at 05:30 hrs and progressed south towards Dover picking-up from various points en-route until we reached our full compliment of 21 people and duly embarked on the ferry to Calais and drove to our hotel overlooking the River Orne in Caen, Normandy. 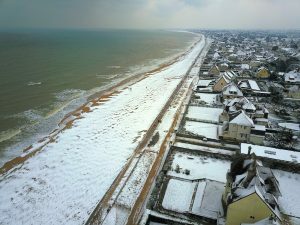 Day 2 – We wake up to a snow covered Normandy! Very strange, but off we go to our first stop at Hermanville-sur-Mer. 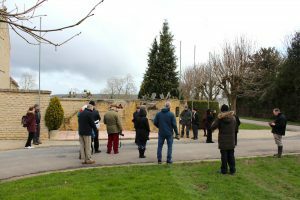 After I have given a talk on Sword (or should it be Snow) Beach we participate in our first Remembrance Ceremony at the 2 Lincolns Memorial with a local delegate from the Mairie (town hall). This proves to be very moving and the 2 Lincolns poppy wreath is laid by our WWII veteran Mr John Blood who landed at this very spot on D-Day. After the beach we visit the nearby Hermanville CWGC Cemetery where we conduct another ceremony. Our next stop is Lion-sur-Mer where the 2 Lincolns fought on D-Day with 41 RM Commando and visit the church to view the 2 Lincolns stained-glass memorial window. Taking a slow route out of Lion-sur-Mer I commentate on Strongpoint TROUT and then we pay a quick visit to the Chateau-de-Lion which was attacked and liberated by the 2 Lincolns on D+1. 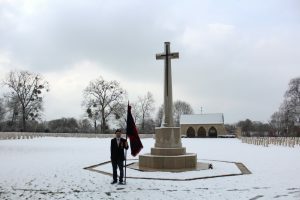 A brief (unplanned) stop at Douvres CWGC Cemetery took place when Mr John Blood informed me that his best friend was buried there – so we duly stopped and John paid his respects by planting a poppy cross and saluting his former friend and soldier. On to Le Mesnil and Cambes Wood where the battalion spent a month in a war of attrition against the tough 12SS “Hitler-Jügend” Panzer Division. We then moved across the bridgehead to Pegasus Bridge where the 2 Lincolns were deployed on 7 & 8 June 1944 for a lunch stop at Les 3 Planeurs Café. The afternoon was spent visiting and discussing the Battle of Hérouville which took place on 8 & 9 July as part of Operation Charnwood – the massed attack on Caen. This is the battle where Mr John Blood was first wounded – he was shot in the chest just above his heart and was evacuated to the UK where he spent 6 weeks in hospital. 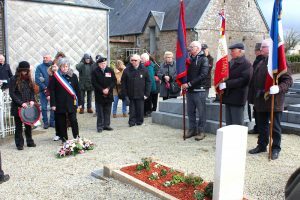 First stop the start-line at Chateau-de-Beauregard and then the village itself where we met a delegation from the Mairie including the Deputy Mayor and the Chairman of the local French Veterans Association – after the ceremony we were treated to a well received Vin d’Honneur. Our final stop on Day 1 was Ranville CWGC Cemetery where 45 2 Lincolns soldiers found their final resting place. This was a very sombre ceremony as the names of the fallen were individually read out and the Lincolnshire Regimental Standard lowered as the last post echoed around the otherwise silent cemetery. A fitting end to our first day covering the first 5 weeks of the 2 Lincolns part of the Normandy Campaign. Day 4 – A quick check under the bus by the driver and we are on our way to Leopoldsburg CWGC Cemetery in Belgium. After a ceremony where we meet local historian François Joosten we make our way to Lille-St-Hubert on the Escaut Canal where we have a wonderful soup and sandwich lunch in the Franciscushof Café which has its own WWII history. It is here that a local jeep owner arrives to pick-up and drive our WWII veteran Mr John Blood the short distance to the British 3rd Infantry Division Memorial by the canal towpath- John is being well looked after! At the memorial there is a large gathering of locals including local Mayor Raf Drieskens. One of our party, Mr Edward Dunstan, takes the reigns for this site and explains very well the action that took place on the night of 18/19 September 1944 as part of Operation Market-Garden and the crossing of the Escaut Canal by the 2 Lincolns on and around this very spot. After an excellent ceremony where flowers and the wreath were laid at the memorial we drove the short distance to Achel where we were guests of the excellent Grevensbroek Museum situated in the building used as British 2nd Army HQ by General Dempsey during Market-Garden. 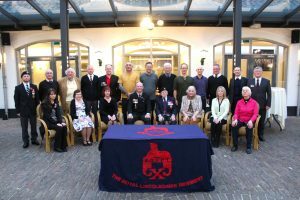 After this interesting visit and the presentation of a Lincolnshire Regimental plaque we repaired to the Michielshof for a splendid glass of finest Belgian Trappist beer before driving the short distance to our hotel in Venray, Holland. 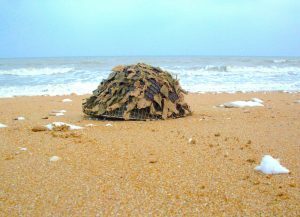 Day 5 – Raining today. First stop the German Military Cemetery at Ysselsteyn where Mr John Blood is presented with flowers from the Mayor of Venray. After an interesting stop at the cemetery we then proceed to the battlefield of Overloon where 2 Lincolns were involved in a particularly fierce battle on 14 October 1944. After giving a talk on the battle inside the bus, eventually the rain subsides and we can walk on the battlefield. Next stop is the huge Overloon WWII Museum where we also take a light lunch. This museum has to be one of the best WWII museums in Europe and although I have been many times there is always something new to see. After our ceremony in the nearby Overloon CWGC Cemetery we visit a private museum on the banks of the River Maas where we are guests of owner Wim Weijs and he explains the history of the museum and his very fine collection. Today we end our tour slightly earlier than usual and make our way back to our hotel in Venray in readiness for an evening presentation by fellow group member Mr Tony Colvin. Here we meet some extra guests from the UK and Tony gives an excellent talk aided by some original film footage on the Battle of the Reichswald which we shall be looking at on Day 6 in Germany. Day 6 – Across the River Maas and into Germany. Today is Tony’s day and he does a wonderful job of guiding us through the various sites spoken about the preceding evening. 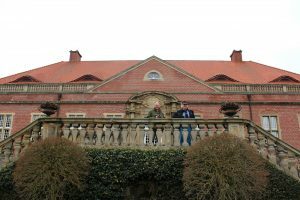 First main stop was Schloss-Kalbeck where we were greeted by the owners and treated to a short tour around their home (a stately home/castle) where damage from the battle is still clearly visible. Across the battlefields and a stop at the sombre German Military Cemetery at Weeze where we performed a ceremony and the names of the German fallen for the Battle of Winnekendonk were read out. Mr John Blood wanted to lay the wreath at this ceremony which he duly did. We visited many sites with the main stops being the villages of Kervenheim and Winnekendonk. 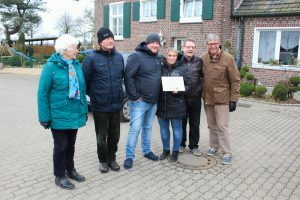 We also paid a visit to Bronkshof Farm where Tony Colvin presented a plaque to the farm owners and one our guests for the day Mr Aldred spoke of his father’s part in the battle (he was in a Royal Scots Guards tank) which was particularly well received – “…and this time don’t f***ing miss!” After a particularly poignant ceremony at the Reichswald Forest CWGC Cemetery – the largest British WWII cemetery in Germany – we began the long drive to Gent in Belgium. Day 7 – Back to 1940 today and the withdrawal of the 2 Lincolns towards Dunkirk. After passing by Ypres and the many WW1 cemeteries we pick up the action at Lizerne. Here I described the withdrawal of the battalion from Louvain (Leuven) through Brussels and Ypres to where we now stood. Local historian Jan who lives in the village allowed group members into the top of his house where there is now a chapel and explained where the 2 Lincolns snipers were hidden in the roof. We then had a ceremony in the local village of Zuidschote where the CWGC Cemetery is incorporated into the churchyard. This is where Captain Tony Cartland is buried with his epitaph “I will surrender only unto God”. This is very fitting as he was killed manning a Bren gun position refusing to surrender and covering the withdrawal of his men. 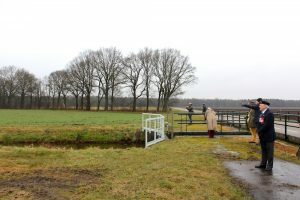 We drove the route of the 2 Lincolns towards the coast stopping at Adinkerke Bridge where the battalion made its last stand before blowing the bridge across the canal. 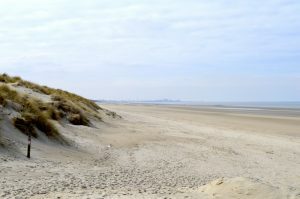 Afterwards we visited Bray Dunes and the The Mole in Dunkirk where most of the men were evacuated from. When the battalion arrived back in the UK only 162 of the original 800 were present. Our final destination of the tour and our final wreath laying ceremony was at the Dunkirk Memorial and CWGC Cemetery. Onto the ferry at Dunkirk and we effectively retraced the battalion back to the UK. After dropping everyone off en-route the coach finally pulled up in Lincoln around 22:00 hrs. All in all a quite excellent tour – which I for one will never forget.